EDITORIAL NOTE: Many no doubt are familiar with Carl Oppedahl, who for the last 10+ years has been writing an e-mail based newsletter. Carl has now joined the ranks of the blogging community and has asked me to notify readers of his new blog. With that in mind, and with Carl’s permission, what follows is a republication of his first blog post, which published on February 21, 2014. In our office we try to track pretty closely the status of the cases that we have put on the Patent Prosecution Highway. It is a rare PPH case that reaches its first Office Action without at least one problem within USPTO that requires us to poke the USPTO. Today one of our PPH cases presented a problem that we had not seen before — a big delay in examination because the USPTO misclassified the case. This case had been made Special on the Patent Prosecution Highway in October of 2013 because of a favorable Written Opinion from a PCT Searching Authority. For a Special case, USPTO’s case management system normally starts ringing an alarm on the Examiner’s desk after a couple of months. So we should have seen an Office Action at least a month ago, maybe two months ago. But that only works if the case has been assigned to an Examiner. Often the USPTO first assigns the case to a SPE and then it is left to the SPE to figure out which Examiner in the SPE’s art unit should actually examine the case. This case got assigned to the SPE in a particular art unit. Let’s call him “SPE V”. It seems that SPE V decided that this case had been misclassified and should not have gone to his art unit. So he tried to get rid of it. The normal way to get rid of an unwanted case (see MPEP § 903.08(d)) is to find some other SPE who will agree that his or her art unit ought to take the case. What we saw in the transaction history in PAIR was that SPE V has been trying to get rid of the case in this way for many months now. He first tried to get rid of the case on October 10 (shortly after it was made Special). He tried again on October 29, and then November 1, and then November 7, and then November 22, and again January 6. Apparently SPE V cannot find any other SPE who is willing to take the case. 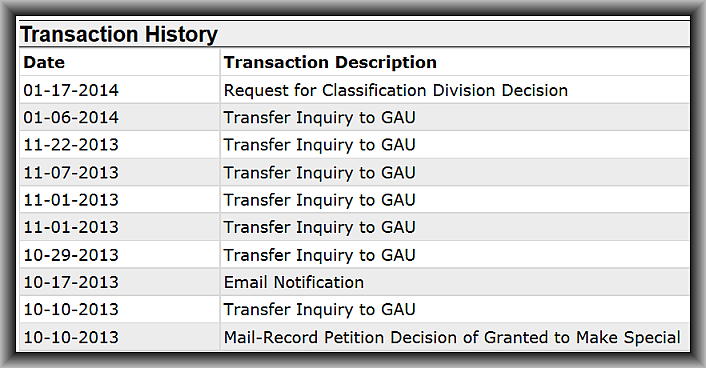 Then on January 17 SPE V did something that I have never seen before in any transaction history of any file — a “request for classification division decision”. As the MPEP describes it this would be a decision of a “classification dispute technology center representative panel”. 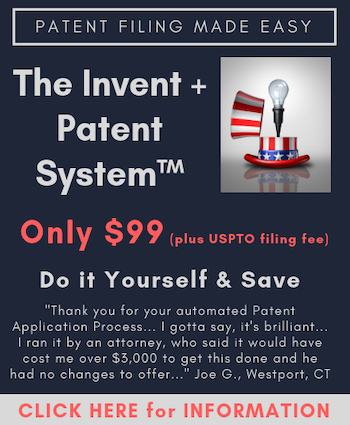 Years ago the classification of newly filed US patent applications was done by USPTO employees. But at some point a decision got made within the USPTO to outsource the classification process for new patent applications. Since then, the classification has been carried out by a government contractor. The contractor often misclassifies cases — in our recent experience this happens about 10% of the time. When it happens, the case has to be transferred from one art unit to another. Normally this only delays things by a week or two. I am not sure what exactly went wrong with all seven of SPE V’s efforts to kick the case. But as of today he has not managed to get rid of the case despite four months of trying. I looked at the case to see if it looks misclassified to me. And indeed it does look seriously misclassified. I can’t talk about the actual classes due to client confidentiality, but it is as if the claims were for television monitors and the USPTO’s contractor had classified it in technology for cross-country electrical transmission lines (that could be used for powering televisions or anything else). SPE V manages an art unit that knows what is patentable and what is not in the field of (say) cross-country transmission lines. And he would prefer that his art unit not be forced to try to figure out what is patentable and what is not in the field of (say) television monitors. When I looked things up to see if I thought it looked misclassified, I was reminded how very poor the classification manuals and resources on the USPTO web site are. If you already know the US patent class and subclass, it is fairly easy to work out what the description is for that class and subclass. But going the other way is not easy at all. It is nearly impossible to do a meaningful text search or keyword search in the manual of classification. You have to sort of already know where in the manual your application belongs and then you go and look in that part of the manual to try to work out the subclass. The application that SPE V is trying to get rid of is a US national phase from a PCT application. In January of 2012, as part of the PCT process the International Searching Authority already carried out the task of classifying this technology. The ISA (in this case, the Korean patent office) figured out that the case is in a particular international patent class. Yes, the ISA correctly figured out that the application had to do with television monitors (to use my example) rather than cross-country electrical transmission lines. Anyway in this case the task of classifying this technology is work that already got done (and got done correctly) more than two years ago. But USPTO did not make any use of that work, and instead sent the task to a contractor who got it wrong. And the consequence is that our client has been denied the prompt prosecution that our client ought to have received on the Patent Prosecution Highway. Carl Oppedahl is a patent attorney who is technically trained in physics, electrical engineering, mathematics, and software engineering, having earned a bachelor’s degree with a double major in physics with honors and mathematics with honors from Grinnell College in 1978 and a law degree in 1981 from Harvard Law School. He has written and prosecuted numerous patent applications in electrical engineering, computer software system, and mechanical areas. Carl also serves as an adjunct professor at University of Denver School of Law, teaching Advanced Patent Law. He served for many years on the faculty of the Practicing Law Institute’s Patent Bar Review Course and served as an adjunct professor at Cardozo Law School where he taught Advanced Patent Law. He has lectured in continuing legal education (CLE) programs in New York, Texas, California, Georgia and Colorado. As a current/former patent examiner, I feel your pain. Our classification system needs help and its only gotten worse since they decided to contract that out to contractors which either can’t do as good a job or don’t care. One problem we have as examiners is a case gets put on your docket that shouldn’t be yours and you can’t get rid of it. The only way is to ask people – I had a SPE one time admit to me that it was his AU’s subject matter but he emailed his AU and nobody wanted it so I was stuck with it. Great, like that’s fair to applicant. We all deal with a pretty wide range of stuff so if it’s that out there someone is willing to go to the effort to try and get rid of then they really shouldn’t be examining it. Another problem we have is a case with multiple inventions that can be quite different. It gets put on your docket because 1 of those inventions is your subject matter so you do a restriction and when it comes back and they elect the subject matter you barely understand enough to restrict your’e stuck examining it because nobody wants to take it. They have come up with a system of pre-negotiating before a restriction (the idea being you show the case to the other area and they agree to take if if that is elected) but that isn’t really all that helpful since it puts more work in the beginning when it might not be needed and doesn’t really seem to increase the acceptance rate. So we as examiner’s feel your pain and I know I personally feel bad when I’m stuck examining something that is really not my area as I will try to do as good a job as i can but in reality I’m not going to be as good as someone with the appropriate background. One other thing I wanted to note – we are moving to a new classification system CPC – which is pretty similar to IPC and both the US and europe are moving to this system. I think it will help in that there will not be that disparity of using two different classification systems but it won’t really help with the issue of finding a home for that patent application. I’m an examiner. The “transfer problem” applications I’ve come across are often applications where the attorney writes an application that is so completely filled with ambiguous/broad/vague/generic terms that the SPEs and examiners cannot even understand or agree on what the invention IS. I’ve come across many examples of this where multiple SPEs all have completely different understandings of what the invention IS. The application eventually goes to “dispute resolution” where a decider makes a decision as to where to classify. The examiner’s response to the application is usually “Huh?” These applications often become “problem” applications for the examiner (and applicant?) one way or another. Transfers are usually no problem when the invention is clearly disclosed and claimed (and there is only one invention being claimed). As the delegated classifier for my Art Unit, in most instances, the applications sent to my Art Unit by the contractors are generally correct but may not always have the right subclass. Those that aren’t, I transfer, and if not accepted, I send them to dispute resolution where they can sit for quite some time before a decision is made. I concur with the above comment that attempting to transfer a case after a restriction can be problematic. Also, I have found that many of the current SPEs are not familiar with the art that they manage and blindly accept the classifications from the contractors and assign the cases. In a recent example, an application was correctly sent to my AU. I saw that it was a continuation, but the parent case was examined in an area that had nothing to do with the disclosed or claimed subject matter. It wasn’t searched or classified in my area. Obviously, the SPE just assigned it to the examner who then did a quick word search and allowed it. I find this happening much too often. I just shake my head.